Marjorie Alfaro Odicio story is one that defies all odds and today still serves as an example of outstanding perseverance and personal growth. To understand how and why the now thirty-eight-year-old “Los Delfines” community leader was able to overcome her various obstacles, we can start by looking at her childhood. At the age of seven, Marjorie suffered from her stepfather’s constant abuses and her mother’s inability to protect her. Marjorie ran away from this horrid reality and at 13 years old became homeless. By age 21, Marjorie found love and got married. Sadly, her own marriage mirrored the same relationship her mother and stepfather shared. Through eight excruciating years, Marjorie suffered from constant physical and emotional spousal abuse that continued even while she was carrying her second son. Marjorie got so intoxicated by the violence she became abusive with her own children. “When your self-esteem is that low, you think of violence as normal.” Marjorie states looking back on her past. Ultimately, Marjorie found the strength to break the repetitive cycle of domestic violence in her relationship and left with her children to start a new life of respect, love and peace. Six years later, Marjorie became an official Minga Peru community representative. She also became the first female to ever hold a leadership position in the municipal government when she was named the “Coordinator of Development Projects”. In that role, she oversaw the construction of a public community center that provides a safe place for children while their parents are at work and a safe place for women to learn about how to overcome domestic violence. 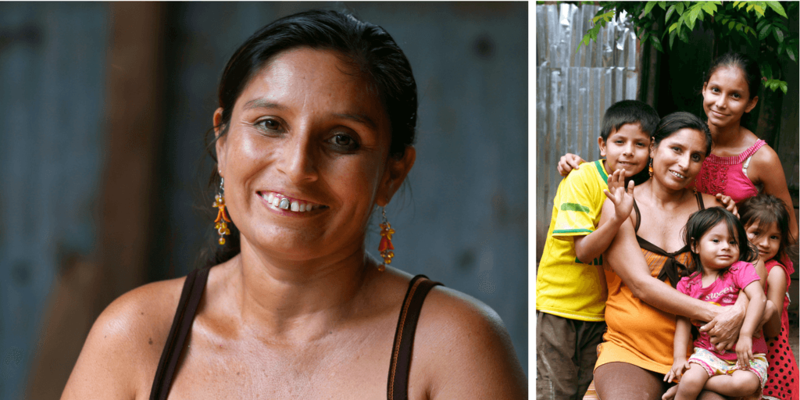 Help empower other women and children like Marjorie in the Amazon.